I am thrilled with the passage of Referendum 74 in the beautiful State of Washington. With all of you, I celebrate Marriage Equality. I will be in Seattle on Sunday, December 9th, beginning at 12:01 a.m. to marry wonderful couples. I will be available throughout this first day to couples of all paths, faiths and traditions – ceremonies big and small. To get on my calendar, please give me a call at 425.922.1325. 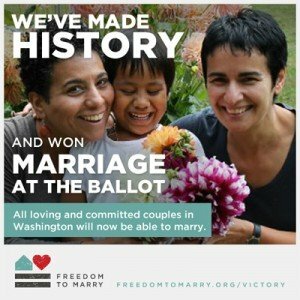 My sources at King County say they expect 600 – 1000 couples during the first three days that marriage licenses are available. The King County Marriage License office in downtown Seattle will be open for extended hours on December 6, 7 and 8, 2012. How do I delicately put this…YEAH! !